I think things would be smoother if I were just running the main C++ version of SFML, but unfortunately I am just way more comfortable in C# which means only having access to SFML.Net. Don't get me wrong, SFML.Net is pretty great, but I think more and more I'm feeling like I should jump off to something else. I like SFML's API, and I think it does a lot of things in ways that make sense to me, but the support from the game development community just isn't there. I know I am probably experiencing the old grass is greener feeling, but right now it feels very tempting to start to build Otter to run with something else underneath it. If I were to switch to anything I think right now my best option would be XNA/Monogame. 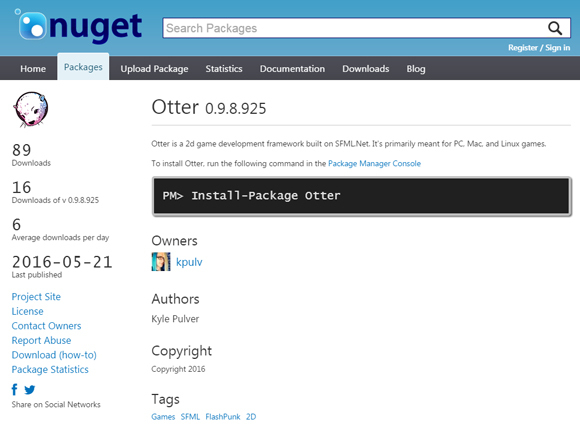 This is just a quick little test, but it is running in XNA with something much like Otter. Monogame seems to have the biggest support lately when it comes to portability which is pretty appealing. Right now I can barely get the latest version of SFML.Net to cooperate and that's after having someone else send me a compiled version of the library because for the life of me I just cannot get SFML.Net to build. Just rambling a little bit here. I did manage to get SFML.Net 2.3 working with Otter... but with an unfortunate downside with texture smoothing that for some reason doesn't exist with 2.2. Texture smoothing for whatever reason now has a weird effect on the edges of textures, and when I try to use those textures in shaders I get weird results when sampling pixels around the edges. Just feeling pretty frustrated I guess! 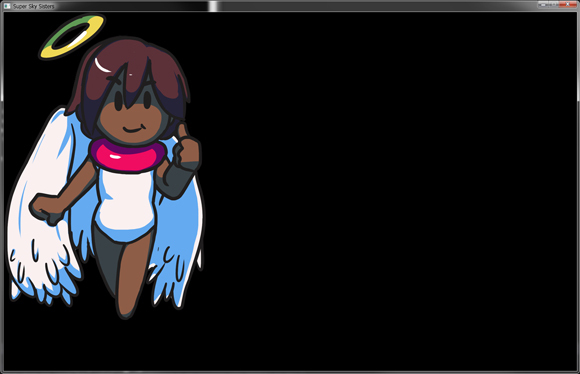 I'm going to go down the XNA rabbit hole a little bit inbetween finishing up Sky Sisters... maybe it's possible to get an XNA build of the game rolling but who knows! * OgmoProject has a lot more utility methods now like GetValue() and GetLayerData(). If you need to check out level data before actually loading a level into a Scene this can be pretty useful. * Added OgmoProject.RemapAsset() for when you need to assign a different path for an asset being referenced in your Ogmo projects. For example if you need to take the path of a tilemap from the ogmo project and reassign it to something else when being loaded into the game. * Fixed a thing that I broke in SetHibox on Entities. * Util.Clamp now supports Vector2 input and output. * Added shortcuts to Scene methods like GetEntity<> on Entity just to make code a little bit less verbose at times. * Added Button.LastPressed and Button.LastReleased. These are both timers that will count up since the last button press and release respectively. Pretty useful for doing input buffering type stuff, or waiting until an input has been released for some amount of time before changing state, and all that kind of stuff. * Added GetFillRect() to NineSlice. * Made Debugger.RegisterInstantCommand() public and added Util methods to go along with it. You can now add debug commands that can be used immediately instead of executing them at the next update. Also fixed some bugs in the debugger related to this. * Added GetTileIndex() to Tilemap and GetIndex() to TileInfo. * More Collider parameter options in all of the Collide, Overlap, etc methods. * Added Scene.GetEntitiesWith<> which is a weird way to grab a list of Entities that have a specific set of Components. This is probably very slow and should be used sparlingly, but it might be useful to some folk. * Various small fixes and tweaks that don't really effect end users. * OnAdded() timing has been changed for Entities. When an Entity is added to a Scene the OnAdded() method is now called after the Entity has updated its component lists. This is so that a component can register with the Entity's OnAdd method before the Entity is added to the Scene. * Added GetTopEntity() and GetBottomEntity(). These methods allow you to pass in a bunch of Entities and find the top most and bottom most entity in the rendering. * Added GetComponent() shortcut methods to Component. * Added CollideEntities<T> method that will return a list of a specific type of Entity. * Possible graphics changes. I want to explore the possibility of reworking the rendering system to allow for multiple transformations to be applied to graphics. This would possibly allow easier parent to child relationship transformations and more. Mostly because I noticed when working on games that I want to have multiple scales, rotations, and translations applied to graphics at times, and it would be nice if Otter had built in support for it.